A highly in depth single and multiplayer adventure that just keeps on going! Creation Zero (or CZ) is an indie game, developed by Velocivision, for the PC. In Creation Zero, players will begin their adventure in a preset world loaded with content and procedurally generated NPC's. Players will dive in to a comical, cartoonish, and action packed story full of twists and turns that will set the players sights on finding the lost creators of the universe known as the cetressites! Players will use the cetress gems of the universe to upgrade their powers and stats as they battle against monsters, explore dungeons, find hidden treasures and even build their own entire worlds from scratch!This game does it all and gives a new meaning to the word "depth". So I know it's been awhile, but I think now is a good time to show you guys one of the biggest custom features in the game. I've been working on this along with other new customizable objects and a ton more. This object is simply, the quest object. Now I know, I've mentioned it in a previous article, but now we will go over exactly what it can do. First and foremost, you can create chapters for your adventure. These can be like sagas and so on. (I'm a huge DBZ fan. ;-)) You can set your maximum amount of chapters and quests at the start of each world along with other options such as maximum variables, planet name, password, etc. You can of course alter these options later if you choose. So lets discuss how chapters and quests work! It's simple. 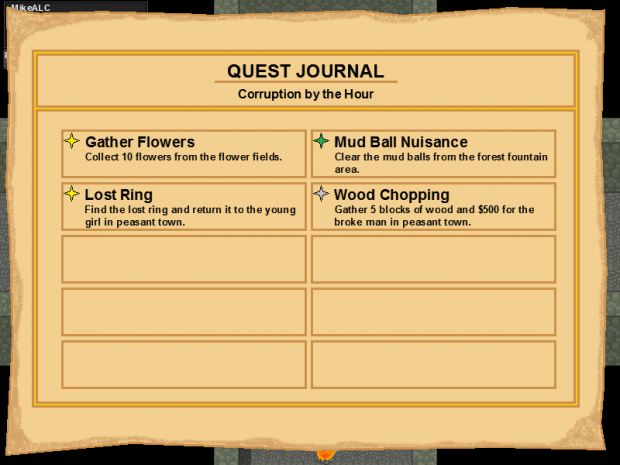 You can enter edit mode and add whatever quests you wish to your log. After doing so, you can edit that quests name, description and chapter. Depending on what the quests chapter is, when added to your log via the quest editor, it will change your current chapter to the quests chapter. Quest management in game is extremely simple. You can click an inactive quest to set it as active, and vice versa. Quests can be dragged and dropped from page to page for convenience and help you know which quests are your top priority at the time. 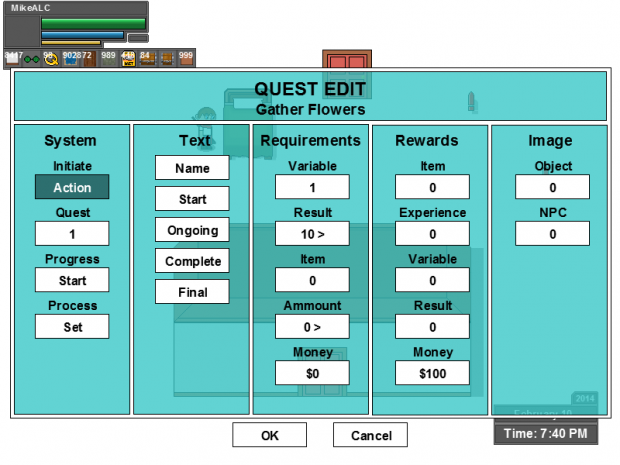 As for the quest editor itself, it is very easy to manage. Simply edit each section as you see fit. To prevent cheating (easy item and money obtaining), I will be making it so that the player must sacrifice their own money and items to give them away as rewards. Experience rewards will cost a lot of cash to grant so that players don't simply cheat the system, and will require that the player editing the experience field, does in fact have a high enough level to meet their settings. Players may set the quests text that shows up in the message box when speaking rather easily. Edit the name, starting text that is displayed to set the quest in motion, ongoing text for when the player has taken on the quest but not completed it yet, complete text for when players get the reward, and final text for when the quest object has nothing left to offer. Players can easily select what quest is added to the log and completed with set requirements along with other system features such as how the quest is initiated (action, collide, auto, parallel) and players can edit the reward variable process as well (set, add, subtract). Quest objects can have any image set for them along with all objects and all NPC's being options. Also, more than one requirement and reward can be set at a time. In do time. Still have a ton of features I want to get in before I release a beta. Thank you for your interest in the game! GIFTS?!? Like just images or interactive gifts like.... a pet???? Gifts can be items, equips or whatever you choose. It's completely up to you. At the time, we do not have a pet system, but that may change in the future. Looks epic, Love the art style and i cannot wait to play it! At this time, it is still in development. A release date will be given in the near future. Been to busy making Creation Zero perfect, that I have forgotten to come on here and talk about it. It is SO much further along now. Soon.. I know I am extremely late on that class article, but it's for good reason! Now we have a fully customizable chapter and quest system in! House stuff has been more hectic than originally planned, but Creation Zero is STILL in development and WILL NOT be cancelled. More to come! News post about classes will be coming soon to Creation Zero on indiedb! Hopefully this house stuff will be settled by the 9th, but regardless, Creation Zero will be back in full development soon! Getting ready to move in to a new house. Updates on Creation Zero will pick up soon! Eye colors can now be changed in CZ and it looks awesome! Also, the player has been altered and is now taller! Check back for a screenshot. Wanted to post an article today but if I posted it at 4:00 PM, it wouldn't be confirmed until about 12:00 AM. Tomorrow, I'll try at about 1. Going to try and have CZ updates on indiedb at least once a week (every Monday) if possible. Keep an eye out for them! New article on the way! Get ready to read about the equip system in Creation Zero!